The first thing we hear in “Midnight of the Century” is a ticking clock, the opening image that then fades in by way of accompaniment its rocking pendulum. 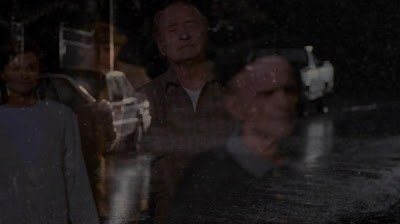 This episode’s title comprises two descriptors of time, and the weight of time’s passage is very much its underlying theme, right from the opening moments in which Frank is first visited by the ghost of a Christmas past that is to haunt him this particular Christmas Eve. Peter Watts’ speech to Frank and Lara at his pre-Christmas gathering speaks to the same themes, to the sense of reflection that this season can often inspire in us, contextualised further beyond his family to the larger concerns that lurk at the heart of The Millennium Group. We are all at time’s mercy, but life’s highs and lows and the all too often irreparable mistakes that scar our passage through it can leave us yearning to have mastery over it, to wind the clock back, to revisit and fix our failings. Angels of course manifest throughout this episode in one form or another, each in their way guiding Frank as to how he might do just this to a fashion. He is at first reluctant to heed them in spite of their appearances, however, and clashes with Catherine over Jordan following her being re-cast from the role of an angel in her nativity play. Catherine knows what Frank’s gift did to him and seeks to protect her daughter from a similar fate. As the conversation flashes him back to his own childhood and similar treatment from his father, though, Frank understands the need to recognise Jordan’s gift for what it is and to support her. If her gift is denied or demonised, then Frank’s family history could so easily repeat itself and Jordan could be destined to live a lonely, misunderstood and burdened life. Here the situation is left unresolved, and it is not until Frank talks his daughter’s emerging gift over with Lara that his next course of action becomes clear to him. And so it is that Frank finds himself finally visiting his long estranged father. He finds Henry Black living alone in a dilapidated yellow house – Frank’s childhood home – itself full of painful memories and regrets. Here we learn more of Linda Black and a fateful Christmas Eve from over five decades ago. Henry’s attitude towards his late wife’s gift mirrors that of Catherine towards Jordan’s, and whilst both are valid and understandable reactions in the face of seemingly supernatural powers, Frank’s overriding fear is revealed to be that of history repeating. Frank’s father recognised that Frank and Linda, his mother, were both gifted albeit in different ways, just as Catherine recognises the same in her husband and daughter and fears for her child’s future. Henry feared that his wife’s premonition of D-Day would lead her to be branded insane, whilst Catherine simply wants Jordan to be able to lead a “normal” life. Pivotal to breaking a rift that has spanned decades between Frank and his father is the picture of the angel that Jordan claims her grandmother helped her draw, identical to the one she helped Frank draw exactly fifty-one years earlier. Frank shows it to Henry, and he instantly recognises the image. Her angel leads the two men to begin a process of reconciliation and forgiveness. 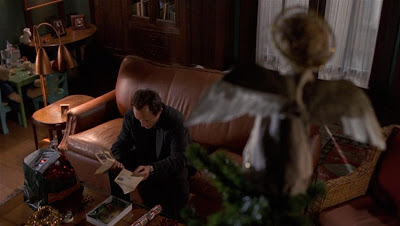 And so the pact between husband and wife is finally honoured through time and the angel does move, as Henry Black offers it to Frank and he in turn gifts it to Jordan, who seems to recognise a sign of her grandmother’s love for her from beyond the grave. The angel connects the family through the generations: past, present and future. Of course, “Midnight of the Century” has a sting in its tale. Frank and Henry’s reunion may have begun to reverse many years of mutual regret over their relationship, but as the fetch of Henry manifests amidst the falling snow before him Frank realises that their time is now short. 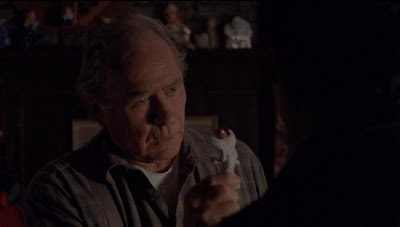 This proves to be the case in “The Fourth Horseman” and, in a poignant moment at her grandfather’s graveside, Jordan returns the same angel to her father to be placed on Henry’s Black’s grave. Again, the angel connects the generations. In sum total, then, the episode is a meditiation on the inexorable passage of time: the upcoming millennium, the midnight of the century, one generation of the Black family mirroring another, the year’s end as a time for reflection. It is a sentiment I share around this season and one that, even after so many repeat viewings, “Midnight of the Century” stirs powerfully within me. A moment’s pause in which to look both backwards and forwards and to reflect upon the passage of time. So, on the eve of another Black family reunion, wherever you are this Christmastime and however you will mark it, be sure to spend your time without regret, tell the people that mean the most to you – especially those you may have neglected – that you love them, and just make the most of the time afforded to you. And Merry Christmas. What the Killer Sees will return in the New Year. 0 Responses to "Midnight of the Century: Angels and Personal Demons"